Welcome back to the Beginner’s Guide. I’ve had a bad habit of leaving many week-long breaks between these articles. This is unacceptable and I’m going to finish off the deck-type articles over the next few weeks. This is especially important given that the I’m onto the combo decks, which fall into distinct categories that aren’t immediately apparent to new players. Furthermore, recent metagame developments such as the recent hype over Sram, Senior Edificer in Cheeri0s, and Grishoalbrand’s win at SCG Richmond’s Classic, indicate that a resurgence of unfair combo may be underway. This may surprise Modern players but will definitely come as a surprise to new arrivals from Standard. Wizards of the Coast doesn’t like unfair combo and works hard to keep it out of Standard. There are a number of specific reasons for this, including bad experiences with Combo Winter and Storm, but what it comes down to is fun. For most players, unfair combo is very unfun to play against. If your game is unfun you have no players and the game dies. Wizards would like to avoid that happening to Magic. The closest Standard has had recently was Rally the Ancestors, and that was closer to a fair combo than a truly unfair one. However, there is a large community of players that really enjoy this style of play. While other Magic decks are playing a game, unfair combo is solving a puzzle. You have all these pieces and limited resources to put together that equal a win. This style of play only happens with really unfair combo. The unfair combo deck is a deck that is built to break the rules. They generate absurd amounts of mana, draw far too many cards, and pile it all together to generate some (temporary) advantage that they leverage into a win before they “should.” These decks are also known as degenerate decks, and not in favorable terms. They’re frequently called broken, and they often are, but broken really just means overpowered. Jund has been broken a few times despite not actually being unfair. Unfair decks may or may not be broken, but they always do things that break the rules. It is important to note that being a combo deck does not make you unfair. As I will detail next week, there are plenty of fair combos. The unfair combos are built around their combo and exploit it. These decks are the inheritors of a lineage stretching back to Prosbloom, the first true combo deck. Unfair combos are built around engines that, when properly fed, produce an overwhelming amount of cards and mana, which the deck channels into a win condition in a single turn. They are similar to the Power Card and Gotcha! decks, in that they consist only of piles of enablers and a few payoff cards, and ask their opponent if they have specific interaction or they lose. The difference is that there is no backup plan if the engine breaks down. You are all-in on the combo, and sometimes it doesn’t happen even if your opponent doesn’t have the correct interaction. The example most players think of is undoubtedly Storm. A deck filled with rituals and card draw that combine in a single turn to combine into a single win condition, classically Tendrils of Agony. This is the hallmark of the unfair combo deck, though not the only incarnation. Any deck that is exploiting some engine to generate a massive mana or card advantage and win in a single turn falls into this category. The greatest strength of the unfair combo is its unfairness. I know that’s unhelpfully tautological, but it is also true. You are playing a different game than your opponent, and they may not be able to compete. Unfair combos are usually very fast, but can also spend as much time sculpting as they are given. In other words they can win before their opponent, but with time they can set themselves up to win regardless of what the opponent has. I heard a story that back around Combo Winter it was believed that the Draw-Go decks of the day were heavily favored against combo decks until High Tide players realized that Draw-Go could never have more than seven cards in hand and if they just waited until their hand had eight must counter spells they could just end their sequence with a draw-seven and always win. That is the power of unfair combo—the field of battle is always on your own terms. However, high power and speed do not come risk free. These decks are incredibly fragile. Just like Power Card decks, they have a lot of cards that don’t do anything, so answering the cards that actually do something causes the deck to collapse. There is usually no resilience; if they fail to go off once, they may not get another chance. In addition to being disrupted, there is always a chance that the deck just fizzles. You need the right cards at the right time and often in the right order to make your combo work, and that might not always be possible. The best analogy I have is that unfair combos are F1 racecars, which dovetails nicely with the truck analogy from the fair decks. When properly maintained and piloted, F1 cars make normal cars look comically primordial. However, if anything is a little bit out of place it doesn’t work at all. The engine has to be the right temperature, the fuel needs to be mixed exactly correctly, the wheels must be aligned precisely, etc., and if anything during the race interferes with that precision engineering, the car doesn’t work. Performance at a price. It is only slightly a cheat to say that you become a Johnny/Jenny type player. Combo decks need to assemble their pieces and then wield them in a specific fashion in order to win. The analogy from earlier is correct: every game is a puzzle that needs solving. Thus the players who are attracted to these kinds of decks tend to be a bit off-beat. When these combos are good many other players will gravitate towards them, but the dedicated comboists will play these decks regardless of conventional wisdom. They enjoy the challenge of building and then piloting them more than anything else. As a result, in my experience they are a polite euphemism for weird. But then, you need to be a polite euphemism to see that Puresteel Paladin + Kite Shield = win. The key to being a successful combo player is to really know your deck. You have to understand how the combo works, not only so you know what you’re building to (much like solving a puzzle by looking at the box art) but also so you know what hands to keep. Combo decks often have to mulligan aggressively in Modern. In Legacy there are so many cantrips that you can find what you need, but that is not true of Modern. There will be plenty of hands that look keepable to the uninitiated, but in truth lack some critical resource to win. Ad Nauseam frequently mulligans any hand that lacks either an Angel’s Grace or Ad Naus, even if the hand is otherwise fine. You don’t have unlimited time to find your pieces, so you need to start the game with a reasonable number. You don’t always have to seek the perfect hand, mind you, but it is important to know the difference between hands that look good enough and ones that actually are good enough. The second critical part of playing combo decks is resource management. My first deck in Extended eons ago was Extended Storm. The hardest part of the deck was cantrip management. You needed to expend your cantrips to find the pieces of your combo, but you also needed enough to keep the combo going once you started going off. It was a difficult balancing act that I never quite mastered. Of course, this was back when you could still play Mind’s Desire, so there was a lot of forgiveness. Your opening hand will rarely have everything you need to win, but often you need to expend critical resources to find even more critical resources to actually start going off. It takes finesse and that takes time to develop. Along with that you need to manage the clock. This can be the actual game clock (Eggs) but more often it’s balancing your need to find pieces against your opponent killing you. You need to learn when it is correct to go off half-cocked and just hope you get there. There’s a lot of finger-crossing and sweating involved in playing combo decks. The final piece is sideboarding. I know that I’ve repeatedly mentioned how important it is to correctly sideboard in Modern but this is a little different. Unfair combo decks tend to be very tightly constructed. 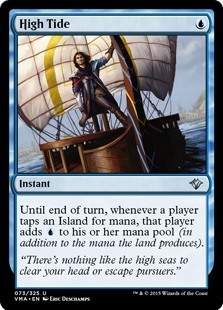 Every card that goes into your maindeck is intended to make the combo more consistent or faster. As a result, nearly any sideboarding will dilute your deck’s fundamental strengths (its unfairness). This will often be an acceptable trade-off when it improves your resilience or invalidates potential disruption, like Leyline of Sanctity against Jund. Therefore, knowing what to cut and when is critical. Equally important is to know whether or not sideboarding is appropriate at all. Sometimes you just don’t need to, or you cannot improve your deck enough to justify slowing it down. It is critical to learn the difference. The most important thing you can do to beat unfair combo is to present a clock. Given unlimited time, they will win. Even if you have all the counters, you will never have more than seven on their turn and they can have eight cards you must answer and force their way though. You have to force them to go off before they’re absolutely ready or lose. Control has a hard time here for this reason. This is not the absolute answer, of course, because combo decks tend to be fast enough that they can win that race. Amulet Bloom frequently won on turn three, well before the aggro decks. Most are non-interactive and built to goldfish faster than other decks. As a result you really need to have some form of disruption. Putting down a clock is good, but actively preventing their combo is better. This can be anything from counterspells to discard, but I recommend using a persistent form if possible. Bloom couldn’t beat Blood Moon, Cheeri0s cannot go off in the face of Eidolon of the Great Revel or Thalia, Guardian of Thraben. One-time disruption is fine, but something that sticks in play that has to be answered is better. A Thoughtseize can be effective for slowing them down, but that is just a speed bump. Against Storm Thalia is more like a steep muddy hill. You can get there, but it won’t be easy. Or fast. Similarly, resource denial is very effective. Blood Moon and Thalia crimping their mana is good, as is stripping hands with discard. But much like the fair decks, if you can shut off an avenue of resource acquisition or their attack, then they’re forced to interact or perish—and unfair decks rarely have interaction. Against Rest in Peace Grishoalbrand’s A-game is useless. More potent is cutting them off from the game rules. Magic lets you play as many spells as you have mana for but Rule of Law effects shut this down. This is especially potent because no unfair deck can win playing only one spell a turn. Finally, if all else fails, just extract their win condition. All the effort that unfair combos put forth is intended to fuel a single kill spell, though there may be several different options. Using Cranial Extraction effects to remove them from the deck might win the game on its own. There is a very real chance that a single Extraction will leave them literally no way to win. You can also remove individual pieces, though this is far less devastating than killing their win condition. Many players really dislike unfair combo. It is boring to watch your opponent play Magic for several minutes while you have to sit there and do nothing, waiting to find out if you’re dead or they fizzle. However, that is also the appeal of the strategy. It is fun to actually play these decks, doing something weird and cool that falls outside of “normal” Magic. I recommend that you at least try a really unfair deck at some point in your Magic career. It is like nothing you’ve done before, and you might discover something about yourself. You might have never realized before that you are a polite euphemism.